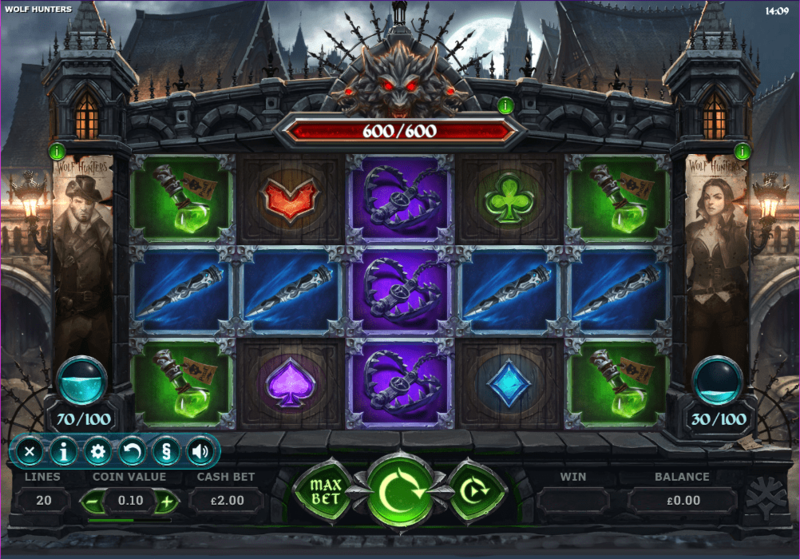 Wolf Hunters is a spooky 5 reel, 20 payline slot developed by Yggdrasil Gaming. It's a great game to play around Halloween and is great for horror fans too. It has a werewolf theme with a scary haunted vibe. You'll join the werewolf hunters on their mission to banish these ghastly creatures before it's too late. You may even pick up a few prizes along the way! Wolf Hunters has some spooktacular features including sticky wilds, werewolf hunts and free spins. This wild online video slot game allows you to defend against a werewolf invasion across 5 reels slots play! The clock has struck midnight and the full moon lights up the dark sky. The werewolves have awoken and are about to terrorise the town. Can you stop them? Wolf Hunters is a terrifying horror themed slot with 5 reels and 20 paylines. Behind the reels, you'll find a spooky scene of haunted gothic houses with scary gargoyles and a misty moonlit sky. The symbols all fit to the creepy theme and include red hearts, purples spades, green clubs, blue diamonds, poison bottles, monster traps and werewolves. Here's a guide for players who wants to play top 10 best slots with great graphics! 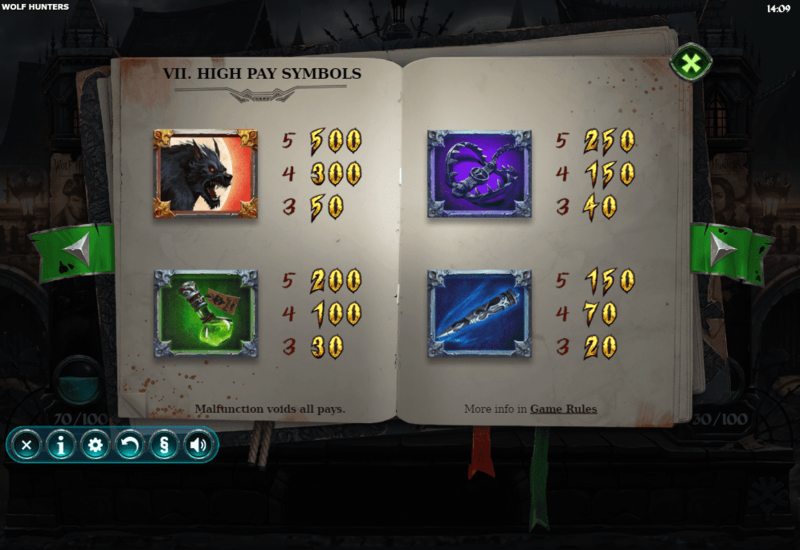 The Werewolf Symbol - The werewolf is the highest paying symbol in this slot. It can appear on the reels at any point in the game and when it appears, the hunter will try to capture it. If the hunter manages to successfully catch the werewolf, then the symbol will turn into a sticky wild and you'll be awarded with a free respin. Slayer Free Spins - When the werewolf gets hit, it's life will decrease by 1. When this reaches 0, the slayer rage free spins feature will unlock and you'll be awarded with 10 free spins. Rage Free Spins - The hunter will get 1 rage point when it hits the werewolf. When you reach 100 rages points, you'll trigger the rage free spins feature. To start with, you will be awarded 7 free spins with the possibility to gain more throughout the feature. Scatter Free Spins - Once this free spins round is triggered, you'll be awarded with 10 free spins. If you land 3 hunter free spins symbols then you'll get 2 more free spins. Once you have been given the extra free spins, the werewolf symbols will turn wild and expand. If you like feeling spooked then Wolf Hunters is the slot for you. Everything about this Yggdrasil slot is creepy from the eerie music to the haunted themed graphics. You won't get bored with this slot as there are so many different features and free spins to play. Have you defeated the big, bad wolf? Try your hand at Heartburst today!